Another not so exciting Indian Grand Prix, yet again with Sebastian Vettel starting on pole and then leading every single lap. After winning the race Vettel now has over 1000 points, a total of 1013, behind only Fernando Alonso (1313 points) and Michael Schumacher (1560 points). British drivers have also just passed the 6000 point barrier after getting 22 more points today, totalling 6013.28 points. The very odd 0.28 points came from the 1954 British Grand Prix, where 7 drivers set the exact same time of 1:50, so each driver received 0.14 points for having the fastest lap. Until 1960 the driver with the fastest lap of the race was rewarded with a single point. Jenson Button had the fastest race lap today, giving McLaren their 150th fastest lap, still some way short of Ferrari’s record of 229 fastest laps. Renault engines also reached a number 150 today, but 150 wins, the third most overall behind Ford with 176 and Ferrari with 220. The 2012 Indian Grand Prix has been the only race so far in the season without a single penalty, no grid drops or drive through penalties at all. There were just 28 pit stops, second least of the season, behind Monaco with 25 stops. After 17 races Vettel has a total qualifying time of 25:38.530 and Alonso 25:42.642, making Alonso 4.112 seconds slower than Vettel in qualifying over the season, an average of 0.242 seconds slower each Grand Prix. In races the gap is even larger, with Vettel’s fastest laps adding up to 23:05.461 and Alonso’s fastest laps adding up to 23:11.828, a full 6.367 seconds slower than Vettel and an average of 0.424 slower than in each race. 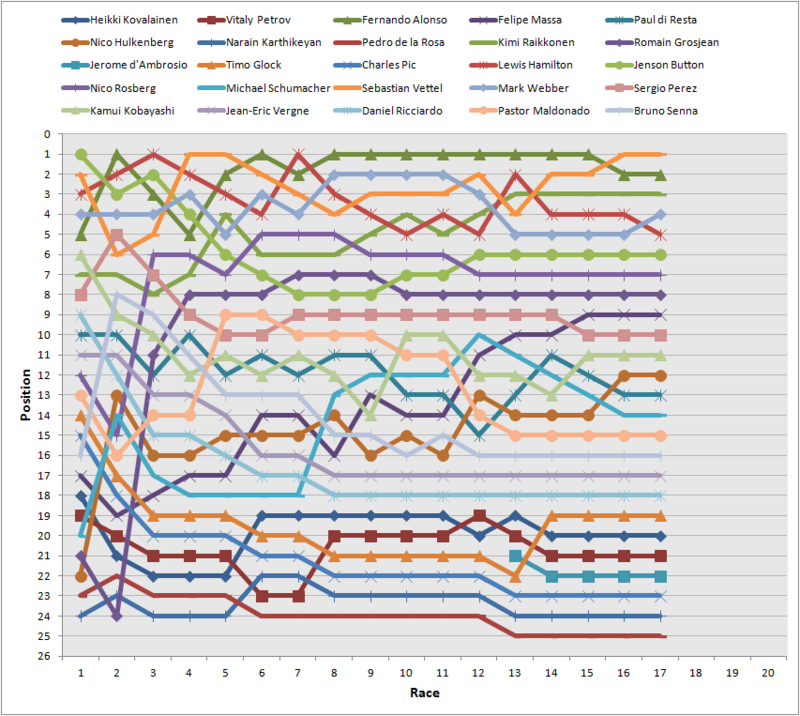 This however is excluding the two races Alonso retired at the first corner to keep it even. 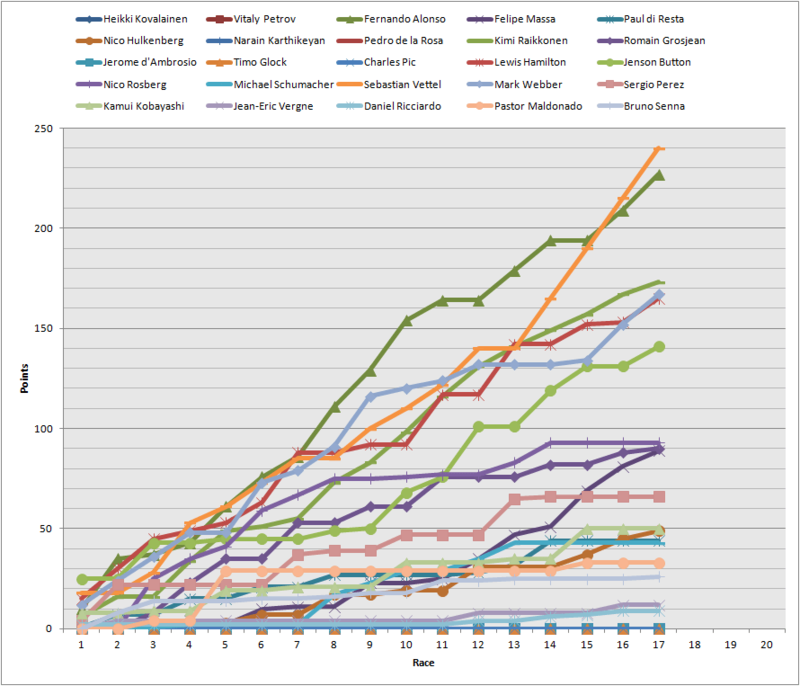 This second graph is the position of each driver in the championship after each race, only the fourth race Vettel has led the championship and only one position change has happened with Webber just scraping his way in front of Hamilton.